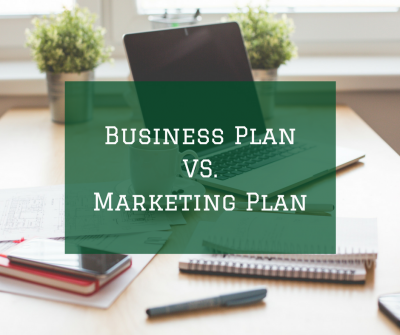 What’s the Difference between a Business Plan and a Marketing Plan? They both sound profoundly important and you know you need a plan, but planning takes time. So, what is the difference between a business plan and a marketing plan and which one do you really need to run your business? A business plan is primarily an overview of your business concept and how you aspire to create a viable and sustainable business. It is written with the intent of winning other’s approval of your ideas and methods in order to receive funding. This type of business plan is a way to prove out your business theory, so to speak. It’s the real-world equivalent of showing your work in math class. You may very well have your vision mapped out in your head but if you’re expecting someone else to fund you, you better prove to them you really do understand the market you plan to enter. You’ll need to convince the banker you have a solid business model because a lender’s primary concern is that you can repay the loan. The business plan is the proving out, on paper at least, the viable path in which to bring a particular product or service to the marketplace in a profitable manner. There are two types of business plans. The first type of business plan is used solely for funding, ends up in a file cabinet or in the virtual folder never to be referred to again. As crucial as it was to get the business started, it serves no purpose once the doors are open. The second version of a business plan, written for internal decision makers, is too cumbersome for the majority of small business owners and that’s why a marketing plan is a perfect solution. Whereas a business plan is written for an audience to get them to buy-in to a concept, a marketing plan is written for the staff or team members in order to execute the day-to-day action items which must be met in order to achieve the larger business goals or corporate vision. Whether you call it a marketing plan, sales, and marketing plan or strategic marketing plan really doesn’t matter, they’re all essentially the same thing – action planning. Making a list of actions and putting them in motion. A marketing plan should include some of the points of a business plan because there are certain key elements which determine the direction of the plan. For example, identifying the vision for the company is essential in a marketing plan because everything in the plan should be driving the company closer to that particular vision, or overall objective. However, the difference between a marketing plan and a business plan is the marketing plan is detailed out in terms of not just conceptual ideas, but a list of actions which will drive results. In other words, a strategic marketing plan is not only the foundation for your sales and marketing efforts – it is a 12-month plan of action items so that you know what you need to accomplish every single month to move you towards your goal. If you’re looking for help with your marketing plan, Marketing Chomp is a self-guided step-by-step workbook which will ensure you develop a fully developed marketing plan. If you need outside help to do all the heavy lifting contact us.